Family-owned and operated, Hart’s has a rich history and knowledgeable service behind it. Here are 5 things you might not know about the 117 year old business. J. Freeman Hart and his brother Jesse B. Hart, founded Hart’s in 1899 after buying out the undertaking firms of Dennis Keating and Author Wood. This acquisition marked the beginning of Hart’s as we know it. The mortuary was established originally under the name of Jesse B. Hart and Brother and was located at 559 Mulberry Street; next door to the Hotel Lanier. The firm added a horse-drawn ambulance, and later, when automobiles came into general use, the first automobile ambulance to be used in the city. Foreseeing the future growth of Macon, J. Freeman Hart bought out his brother's interest and the business renaming it Hart's Mortuary in 1914. Hart also hired the first woman embalmer in the industry. The firm eventually outgrew its original building on Mulberry and in 1931, J.Freeman Hart contracted with R.H. Smalling & Sons to design and build one of the finest funeral homes in the south at 765 Cherry Street, its current location since 1931. The new location touted a cremation plant, the first one south of Cincinnati, Ohio and Mr. Hart was the first arterial embalmer in the state of Georgia. The mortuary's Cherry street location was the first mortuary in the state of Georgia to be built as a funeral home. During that time period, funeral homes were converted churches or homes, with some still being used today. In the early days, embalming was done at the deceased's residence and the body remained in the home until burial; hence the term "sitting up" with the dead. The White House had a scenic panoramic wallpaper installed in the Diplomatic Reception Room, thanks to Jackie Kennedy's White House renovation in 1961. It’s an 1834 antique French paper from Zuber called Scenes of North America. The complete set of 32 somewhat fanciful scenes, based on engravings of the 1820's, shows American landscapes that were particularly admired by Europeans. In the late 60's, Freeman Hart purchased the rolls of Zuber's Scenes of North America and the wallpaper was installed in the back foyer where it still remains intact today. When examined closely, the Masonic symbol is embossed on the paper. 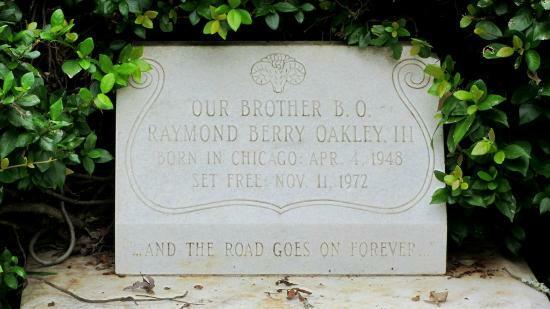 Just a year after Duane's death, Berry Oakley died on November 11th 1972. At 7:00pm on November 15th Hart's Mortuary was packed with family and friends and many of the musicians who had been part of Oakley's life. The Allman Brothers played his memorial service at Hart's Mortuary.